Everyone likes fresh baked cookies, and everyone likes Valentines Day gifts. So how about these great I love You Cookie stamps, for that special someone in your life. These are definitely the perfect way to tell your loved one how you feel. If you like baking cookies then this great little gadget is just for you - even more so as we approach Valentines Day. My wife saw this a while ago and purchased one just for the fun of it. I must say I get 'I Love You' fresh baked cookies for Birthdays, Christmas and just about any other occasion, but it's great..! What is the 'I Love You' Cookie Stamp..? They say the way to your heart is through your stomach and nothing could be more so than a home baked cookie with the words "I Love You" right there, set in that delicious, warm, freshly baked biscuit. This handy little cookie stamp gadget is a must for anyone who bakes at home. reverse way around with heart shapes in the middle. The cookie stamp is the perfect size and shape to use when baking your fresh cookies. 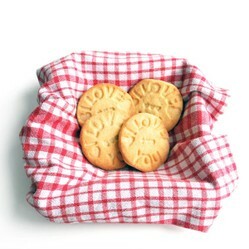 When you use the 'I Love You' Cookie Stamp, you find it fits snuggly into the palm of your hand and has a perfectly shaped wooden handle that measures some 100mm or 4" high in total - perfect fit - not too big, not too small. The cookie stamp itself is 70mm diameter, thats works out at just under 3" and is a perfect home baked cookie size.